Every now and then I pick up Indy and step on our balance to check his weight. The results are displayed in the figure below. 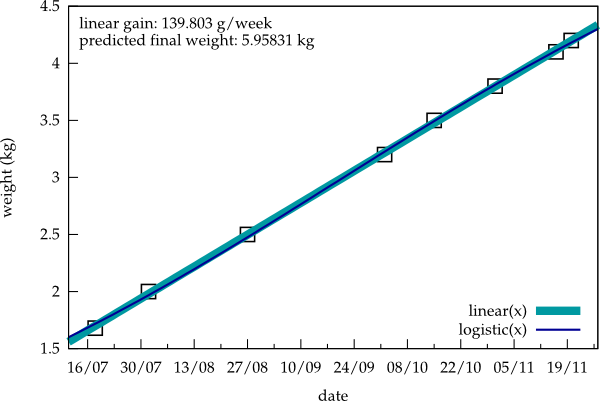 The thick, light blue line is the result of a linear fit, revealing a weekly weight increase of about 140 g. A deviation from linearity is not yet apparent. That's why the second fit by a logistic function (thin dark blue line) and the resulting prediction of a final weight of about 6 kg is not very accurate at the moment. Update: For some reason, webkit-based browsers such as Chromium don't handle the particular svg above correctly, but add huge upper and lower margins. I thus have replaced it for the moment with a png.